Updated 4/15 with additional reviews. Game of Thrones, Episode 801: "Winterfell"
For this final season of the HBO hit Game of Thrones, we are collecting reviews and impressions from professional TV writers for each individual episode, beginning with "Winterfell," directed by David Nutter. Check this site each Sunday night for the latest reviews. While we won't try to assign an overall score to each episode, we have grouped the reviews into rough categories based on critic enthusiasm, beginning with the most positive. Scores for individual reviews are displayed only in those cases where a reviewer has specifically indicated a score. (Those scores have been converted to a 0-100 scale when necessary to facilitate comparison.) "Recaps" are not included if they merely discus the plot details and fail to assess the episode's quality in any way. Click on any publication name to read the full review. Somehow, like an elite long-distance athlete, Game Of Thrones has found an extra gear in the final furlong. ... For the sheer speed and quality of storytelling, for the amount of unforgettable moments and surprises, this is easily the best of the eight [season premieres]. The most dynamic and eventful season opener in the HBO drama’s nine-year history. ... Dots were connected at a brisk pace ... but not at the expense of eloquently cut dialogue, ongoing character development, stunning scenery and an often wicked sense of humor. It was all over too soon in 55 minutes. I liked this episode, and I think I’m going to really like the finale in general. We’ve spent the first seven seasons seeing the show change in ways good and bad, and I think by now we kind of know what we’re getting. It may not be perfect, but it’s absolutely riveting, and I think the proper way to treat season eight will be as a kind of tense, revelatory victory lap. “Winterfell" [was] a season eight premiere that gave fans everything they could have wanted and more, a terrific start to the series’ final run of six episodes. ... The episode very deliberately rhymed with the series’ very first episode, which aired all the way back in 2011. From the central premise of a large retinue arriving at Winterfell to individual shots, the whole episode gave the series a distinct feeling of coming full circle, something that will hopefully continue throughout this final season. ... [But] Jon and Dany’s romantic dragon ride was extremely silly. If anything, this episode made me marvel at just how much has changed since this whole journey began, which is clearly what Benioff and Weiss intended to do before they knock down the next set of dominoes. After a two-year gap and a dragon’s-feast worth of hype, fans probably wanted grand plot movements. Instead, they got a buffet of inevitabilities (Daenerys arriving in Winterfell; Jon learning of his parentage), some spooky but short set pieces (the SEAL Team Six–like rescue of Yara; the pinwheel of severed arms), and one long sequence of lighthearted dragon flying that evoked Harry Potter seeking a Snitch. Yet I’d argue that this was the best Thrones episode in a long time. 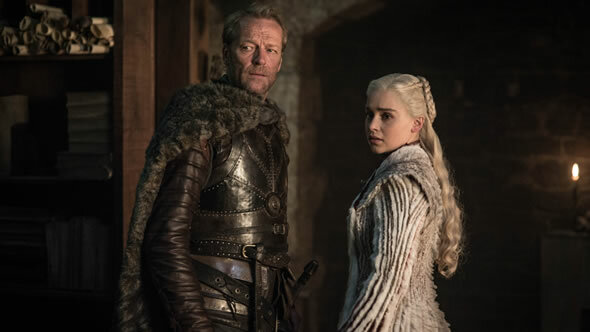 fter the disastrous Season 7 channel surfed between far-flung battlefields and contrived confrontations, Thrones looks to have re-centered itself in human relationships and a concrete time space. This episode’s shocking conclusion spoke to how much Benioff and Weiss have exhausted their bag of narrative tricks. “Winterfell” was, like every season premiere, a fine bit of table-setting that served as a helpful reminder of where every character is, so that the viewers can have their bearings when things start to get chaotic. But the end of the episode was a grim and portentous warning that the White Walkers are … still en route. After eight years, you’d think that memo had been well and fully received. ["Newbies" review, with no book spoilers] “Winterfell” does a lot of work in a short amount of time, but unlike some previous episodes that engaged in significant table setting, it never feels too rushed or like characters are being given short shrift in the effort to hurry to the next beat. It plays as elegant, for the most part. ["Experts" review, for people who have read the books] Very little of consequence happens in the episode, but ultimately I’d argue the episode makes a good argument for why that was necessary. It’s one last chance for us to spend time with these characters without the shadow of war hanging over them. It’s a chance to have the reunions we’ve been waiting for, bring characters together who have never met, and surface information that complicates the relationships that will be crucial to any war effort being mounted in the weeks to come. It may create an hour of television that doesn’t really move the needle in terms of the discourse around the show, but it’s an effective engine for investing us in the characters and their fates, in a way that simulates the experience of rewatching the entire series for those of us who didn’t make the time. “Winterfell” seems to have rediscovered the way the show originally engaged its rabidly attentive audience: by parsing out and paying off in equal measures, encouraging viewers to lean in, enjoy and speculate with equal ferocity as this story rapidly approaches its end. “Winterfell” is, thankfully, a more deliberate but still exciting introduction to Game of Thrones’ final bow, one aimed squarely at the horde of the undead on the move, but also on the tenuous tapestry of alliances woven together at Winterfell, and the tension in every corner as to who should direct it. As a whole it was a satisfying season premiere, but not quite the blockbuster that a final season promises. If what you wanted from the first episode of the final season was a lot of scene-setting and piece-shuffling ready for the clashes and fallout to come, then Winterfell more than delivered. It's the true strength of a layered, character stuffed saga like this that so many scenes can be given over to conversations between people that haven't seen each other in a while and it can still work. There were some monumental events in this episode--which will hopefully be the case for every episode of the final season. But from Jon finally riding a dragon to his finding out that he's the true heir to the Iron Throne, even these long-awaited, emotionally charged moments are really just setup for conflicts to come. A sedate affair, concentrating largely on retrenchment, and narrowing the scope of the narrative and emotional landscape. This was doubtless disappointing to the many who expected nothing but mighty spectacle all the way down the home straight, but pleasing to those of us who found that the sprawl of later series was dissipating our ability to care about the characters and rendering the (many) deaths, twists, unions and partings increasingly insignificant. If you think that the premiere needed to actually start the business of stalking the invasion of the chilly undead because we don't have time for dithering, you probably were frustrated and perhaps even annoyed by the episode in the same way that a subset of Man Men fans were infuriated that the second half of its final season began with a couple episodes that felt more meandering than they needed to. If you're just happy to have these characters back and interacting with each other and you were hoping for some laughs, several well-earned verbal skirmishes and a few series-shifting revelations and meetings, then the episode was an assortment of little pleasures, with a handful of thrills, one fright and some high drama mixed in. The episode might be full of laughs and warm reunions, but this atrocity, this eerie undead fate, is what all of these characters are facing. It’s a good reminder of what is at stake, and frankly, the episode could have used more of these weighty moments and heightened tension. ... This is not to say that the sweeter and lighter character moments are unwelcome. But they should also exist alongside the dangerous moments. So why did it feel so underwhelming? Please don’t get me wrong. The season premiere wasn’t bad, although it certainly engaged in some of the bad habits that plagued the show last season. ... The issue is, the episode was so packed full of important moments but was done so workman-like, it felt like the show was trying to get all of these scenes done and out of the way as quickly as possible. The pace of Thrones has increased exponentially since season one; but the plot seemed to pause in this opener. Some fans might be frustrated by a dialogue-heavy, action-light hour so close to the show’s ultimate finale, but it felt right to allow the characters to breathe before diving back in to the Great War. More of a fan-pleaser than crowd pleaser. ... So yes — absolutely — well worth the wait. Again and again, we get set-ups for the kind of conflicts that, in seasons past, would simmer over the course of four or five episodes. Now, instead, they boil over in the very same scene they're introduced. It's not immersive, no – but it's efficient. A season premiere that felt both sedate and deeply satisfying. Other than one picturesque, disturbing death of a minor character, all the action was of the interpersonal variety. It may seem frustrating that a sixth of the season — a sixth of the last remaining episodes! — was spent on what basically amounted to an hour of long-awaited reunions, but I’m happy we got some emotional pay-off before the real battles begin. This is an hour set aside for the sole purpose of getting everyone together, and seeing what they need to say to each other. But it does that very well. ... The good news is that HBO seems to have ransacked the Iron Bank, because just about every shot looks beautiful, and while previous seasons often rationed out the effects shots, it seems like everything is on the table visually for this table-setter. Any feeling of incompleteness at the end of this first episode should come as a sign of encouragement, proving that there is a game left to be played, even in a war zone. Hopefully, the show will continue to braid and twist what few plot threads remain as the season goes on. As exciting as the War for the Dawn is, Game of Thrones genuinely doesn't feel like it was ever meant to boil down to one side against the other. Rousing, crowd-pleasing and often very funny (how many GoT episodes can you say that about? ), the kickoff for the show’s eighth and final season brings long-estranged characters together at an unprecedented pace, like it’s checking off items on a shopping list for a fan-service speed run. It’s great fun. But is it, you know, great? ... It’s all so conspicuously fan-friendly that it almost makes you wonder: What is this show, and what has it done with Game of Thrones? All in all, it was an hour filled to bursting with closure and full-circle moments involving characters who hadn’t seen each other in years. ... Game of Thrones can be a fundamentally cold show, particularly now that Winter has come, and the army of the dead with it. But this last rush of warmth couldn’t have been more welcome. Though ‘Winterfell’ was light on action — nary a White Walker was killed, let alone anyone else — the hour fulfilled its obligations to the audience through other, perhaps more poignant means. Scenes are just three to four minutes in length, but they’re filled with such richness of both dialogue and delivery that hardly anything feels shortchanged.This approach isn’t always successful ... Fan service also occasionally gets the better of “Winterfell,” with characters who no longer have anything to do with one another forced to exchange grim pleasantries with one another, simply because they’re in the same place. ... For the most part, however, “Winterfell” displays remarkable focus. Many of those fans likely expected fire, death and destruction from the first moments, and those who did might be disappointed by the gentle and typical opener that accomplished what nearly every season premiere in “Thrones” history has done: Re-established characters, locations and relationships, and set the table for greater things to come. ... The pacing was too fast at some points and too slow at others, but it sets up the season for success, if writers can squeeze everything into those five remaining episodes without making them seem overstuffed (no big deal). “Game of Thrones” ... had been in its early seasons a show with an elegant ability to, brick by brick, construct stories methodically. The suspense of waiting for moments of chaos, when they inevitably broke out, was part of the joy. Now, perhaps, the conflagration is here — as the Dead march south, there’s not a moment of respite, so perhaps the jarring suddenness of moments towards the end of the season premiere, the inability to let story points breathe or land on their own, makes sense. But it saps the moment of some of its power to have it raced through, and is a reminder of aspects of the show that have fallen away as “Thrones” left behind its published source material, and became something bigger than a hit. ... [But] “Thrones” is doing absolutely stellar work within the bounds set around its current era: Highly burnished entertainment that lingers on no story point a beat more than strictly necessary to communicate the idea. Dwelling on the shows it once was and no longer is seems perhaps beyond the point. Despite having already had the best part of seventy hours to get all the pieces in position, the bulk of ‘Winterfell’ is still just that – arranging all the remaining characters at one of the two main remaining locales. We have been promised a series of finales, six bumper episodes of Hollywood-scale ambition, where stories that have been drawn out over 70 hours will finally reach their conclusions. There will be love, death, enormous battles. This episode doesn’t do much of that at all. In most respects, it is a classic opening throat-clearer, clocking in at just 50 minutes without adverts and bringing us up to speed. ... I like Game of Thrones, but I’m not sure I love it any more. In the blandly decent first episode of the final season, Game of Thrones started flicking the lights, putting characters in place for whatever comes next, while running through a number of long-awaited reunions and first-time meetings. It was less an episode and more a breadcrumb, leading us to the next breadcrumb, which will lead us to the next one, until said breadcrumbs get scorched by dragons, destroyed by White Walkers, or sliced up in some other internecine dispute—and on and on, until we come to the end. ... Momentum, the idea that we are hurtling toward some conclusion that will explain it all, has been so encoded into the Game of Thrones experience that in the absence of any forward motion, the show is … kind of dull. It’s hard to imagine being satisfied with a premiere that broke almost every reunion (plus a few crucial introductions) into either a quick, quippy tease or several minutes of mostly unnecessary exposition. Add to that the cringey awkwardness of just about every scene between lovers, and Game of Thrones has kicked off its final season by amplifying many of the past few seasons’ worst mistakes. ... As in season 7, the big problem with “Winterfell”—the reason it felt more like an unlucky videographer’s rendering of an exceptionally dysfunctional family reunion than like a carefully crafted story—was the pacing. What did you think of Sunday's episode? Let us know in the comments section below. I've seen every episode of every season, but I was a little apprehensive coming into this final season, thinking it would be tailor made for the fanboys/girls. Happily, it was a pretty amazing table-setting episode. Glad they didn't wait to explain his lineage to John Snow. And I'm glad Sam was the one to tell him. They are great together.